The end of Week 3 already! The usual whirlwind of the beginning of term is starting to settle into the rhythms of the days and weeks in the classrooms. I hope you and your family are also settling into the year. The new Faculties are settling into their own rhythm now – meeting every Tuesday after school. We are still developing the Specialist Faculty, but already the new structure is allowing for improved communication and collaboration between the Class Teachers and our specialists. One of the current topics for the Faculties and the College as a whole is the review of our student reporting cycle and format of reports. We look forward to sharing the recommendations of that review in the near future. The rhythm of my days has also started to settle. I have been fortunate to have many conversations over the past couple of weeks with our teachers, general staff and parents about the past, present and future of our dearly loved school. Thank you all for offering me your ideas and perspectives, and sharing your concerns and fears as we move through a time of change and renewal. Please feel free to approach me, or to email or phone if you have any questions or ideas. Our little boats have set sail. Our kindergarten journey has begun- what a fine beginning it is. The weather has been kind to us this last two weeks, not too hot! 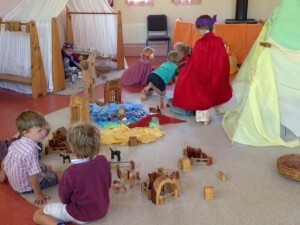 The children settled in very smoothly – a credit to you as parents. There is some tentativeness with some of the children but this is to be expected. It is a big adventure for the children. As our time together grows they will become very confident with knowing what is happening at Kindergarten. Thank you for your support, and joining me in singing the morning verse at the start of the day. This is a great transitional activity for us all to share. Our morning circle time at present is very simple. It will build as the term continues. Our story is about a baby koala who becomes a little more independent and grows to be a little koala – perhaps you have heard some snippets about the little koalas adventuring at home already! 1. Parent night, 23rd Wednesday 7:30pm. I look forward to seeing you. 2. I am available to meet Mondays all day, and Thursday 3-4pm, (or at other times by arrangement). Please use the communication book to request a time, or ring the office. 3. The book titled ‘Kindergarten 2016’, is on the parents notice board stand. It will be a montage of our year together, please enjoy! I look forward to seeing you all next week, when our adventure continues. We are all a little tired this week after our four full days. The children are continuing to settle well, some wonderful play ideas are developing and they are enjoying helping with the many special jobs as we care for our Prep room. A Prep Newsletter went home this week with reminders about our Class Meeting on Thursday 3rd March 7.30pm. Also please write your name on one of the lists for Parent-Teacher Meetings if you would like see me on a Friday over the next three weeks. Class 1 have been doing lots of Form Drawing with straight lines and curves. Farmer Brown has had many tricks played on him and only his horse Jasper knows that it is the fairies, because Jasper always sleeps with one eye open and one ear up! We have been learning to care for each other every day as we play together in our Class 1 space inside and outside. We have also begun Spanish with Jose, Craft with Chris, Eurythmy with Nicole and Movement with Sue. As well we welcomed a new boy, Max, to our Class – a very busy two weeks! Thank you Class 1 Parents for all your wonderful support. This past week we have continued to enjoy hearing Aboriginal stories from the Dreamtime about the unique qualities of our Australian native animals. We had a great morning last Wednesday over on the island of our dam, learning how to make string with indigenous grasses and creating bark canoes with Cassia Read, one of our multi -talented parents. Thank you so much Cassia for all your preparation, giving your time so generously and for sharing your skills with us. Our Class Meeting is scheduled for next Thursday evening Feb 25th at 7:30pm. Sue Murphy will join us to discuss our Movement program and I will share an outline of our Class Two year, plus a chance to view the children’s work thus far. I look forward to seeing you then. 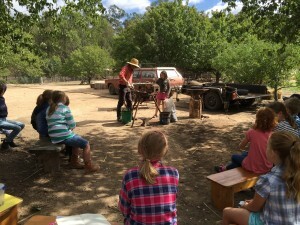 Class Three are off to Seymour today on an excursion in which they will be introduced to alternative farming techniques and a wide variety of farm animals. We look forward to hearing about their experiences in the next Penny. With strong strides and words, Class Four is travelling through The Kalevala meeting blacksmiths, eagles, singers, witches, elks, swans and many beautiful words. 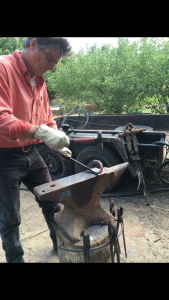 We have explored alliterative poetry, painted, drawn with chalk pastels and created images out of clay, Thank you to Peter Foran for bringing his forge and anvil and allowing us to help in the forging of a wonderful twisted fire poker out of a plain piece of metal. We have also enjoyed some tasty and interesting meals on Mondays, created out of the garden by Lisa and four of our class members. Our Ensemble class group is moving along strongly and we are enjoying the full sound of the whole class playing their instruments together. It was lovely to meet up with you all last week at the Class Meeting. The children are continuing work on our Main Lesson about Ancient India and are now producing some excellent work. They are beginning to write – and read – some very well composed stories about their learning, and it is now that we really see the fruits of all of the wonderful literary experiences they have had over the years within our curriculum. The class is so settled and already well involved in craft, making beautiful elephants under Chris’s and Melinda’s expert eyes. We are so grateful to have Sue Murphy visit us to give a helping hand for some of the Main Lesson, which gives a greater opportunity for individual assistance for everyone. Please could you all consider whether you may be able to give up some of your time to take on the role of Class Carer? It is great for us as teachers to have the experience of working more closely with the parents of the group in this role and is a role which can also be shared between two if that is required. We look forward to seeing you all this evening (Friday) at the Botanical Gardens for an early BBQ. The children have continued to do great work in their Medieval Main Lesson, as well as in all their other work, which is great to see! New subjects, like French and ICT are also being greeted with enthusiasm. I’m looking forward to seeing you all on Tuesday at 7.30pm for our Class Meeting. It has been good to catch up with parents recently. Even though the designated times are past, I am more than happy to find a time to chat if you wish to. Concerning all acts of initiative (and creation), there is one elementary truth, the ignorance of which kills countless ideas and splendid plans: that the moment one definitely commits oneself, then Providence moves too. All sorts of things occur to help one that would never otherwise have occurred. A whole stream of events issues from the decision, raising in one’s favor all manner of unforeseen incidents and meetings and material assistance, which no man could have dreamed would have come his way. Their Skills Based Project topics include; Starting a Poultry Breeding Business, First Aid Certificate Training, Natural Horse Training Methods, Designing and Making a Chess Set, Coaching Junior Soccer Players, Designing and Making a Knight’s Helmet and Armour, Creating Optical Illusion Designs, Learning about the nature of a House, and Caring for, Milking and Making Goat’s Cheese. We are all well underway in our projects in Craft, revisiting skills taught previously, remembering techniques and learning and practicing new skills. There is great excitement and anticipation in many classes, working towards the completion, birth and transformation of raw materials into beautifully created pieces. Here is an overview of each class’ projects and techniques learnt & practiced. Penny time again already – what a busy couple of weeks this has been! Classes are in full swing again, often quite literally – moving geometric forms, lemniscates, four-leaf clovers, waves, straight lines, stars and more. It is such a delight to introduce the new pieces we’ll be working with in the different classes, and see the students light up and grow into their new times of life. A number of students have also been coming regularly at lunch times to do more Eurythmy. Seeing their ease now at understanding and integrating the Eurythmic movement, and also their ability to share and communicate this with those new to the school and to Eurythmy, is moving in every sense of the word. They will have the possibility then to be part of performances coming up at the end of term. Anne-Meike Gassmeyer has been playing piano, contributing to classes, and making these lunch time practice sessions possible. We trained together in California and she is here until the end of this term. We are preparing a Eurythmy performance together to offer the community. On that note, more will come soon – but for now, date to diary: Eurythmy Performance, Wednesday March 23rd, 7:30pm. French language students in Classes Six, Seven and Eight have made an enjoyable start to 2016 and have quickly settled into their studies. Dictionaries are distributed, the homework program is up and running and we are already refreshing our French memories – or establishing new knowledge – through greetings, numbers, colours and even a few songs. This week students have listened to French children’s storybooks – an excellent exercise in word recognition and whole language translation – and learned to introduce themselves to others as well as to give the date of their birthday. In terms of culture, the festival of Mardi Gras has been explored and the tradition of consuming crepes before the beginning of the Easter season. It has also been a delight to establish a regular little French song session with the students of Class One! We are looking forward to finding French connections in our Main Lesson themes over the next few weeks and adding to our store of new words as we go along. Nine years after planting grapes all around the Eurythmy room the children all have been able to eat them, albeit selectively! As Autumn approaches shoots stir underground and out windmill grass is in full bloom. Have a look along the side of the driveway. What is this strange object? Class Four had kohlrabi salad from the garden this week. I love my varied work here; there’s always someone and something interesting to work with, and I particularly love it when creativity is involved! 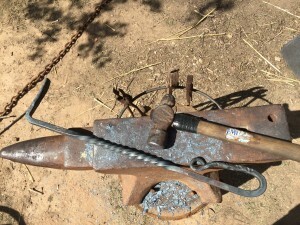 One of my interests is blacksmithing and I’m always delighted when able to include hand forged pieces of my work around the School. As Class 4 have been studying Norse mythology, including Norse craftsmanship in the ancient art of blacksmithing, this week I brought my mobile ‘Smithy’ in; forge, anvils and other tools, and worked with them on a small project to give them some small experience of the work. The children were very keen helpers, especially with working the hand operated blower to maintain the draught for the heat! They did very well with it and could see that working the red hot iron was very similar to working moist clay, which they had already done to get a feel for how the iron can be worked! Some of the children were so keen that I wouldn’t be surprised if they got their own forge! Please ensure your child brings their instrument and music on these days. i Hola a todos ! We are working very well recalling and learning (some classes) all the ways of greeting people in Spanish. New vocabulary about animal colours, the local environment and a lot of beautiful songs are flowing in every class. The younger classes are very excited about their new journey with the Spanish language. For a lot of children, this is their first Spanish experience singing, drawing and writing. Thank you all for your priceless support to this program. We are all submerged in the Swimming Lessons, a wonderful program run by great teachers. The children are having extra time this year in the pool after new arrangements were made with the bus company, who have very kindly decided to help with the runs into town. Back in the school, Classes 5, 6, 7 and 8 had their first PE session of the year. Class 7 and 8 are having a ball with the new table tennis table. They are improving their ping pong skills so much. Thank you to everybody. Field Naturalists will be cleaning up the roadside near our school. Please join them on Saturday 20th February at 9am on the Corner of Pyrenees Hwy and Golflinks Rd if you can spare some time. Sturdy shoes & gloves are required. Unfortunately no children under 16years old. On days over 38 degrees the school recommends that parents collect their children from their classrooms at 1pm. Children remaining in the school will not play any sport or other strenuous activity. Please remember that you must sign out your child at the front office before leaving the school. Children who are picked up by other parents must have written and signed permission from the child’s parents or guardians before the accompanying child is able to leave the school grounds. A reminder that if Code Red days are declared the school receives notification by 12noon the preceding day. Once a Code Red day is declared parents will be informed by SMS of the school’s closure. Schools and children’s services listed on the DEECD Bushfire At-Risk Register (BARR) will be closed when a Code Red fire danger rating day is determined in their Bureau of Meteorology district. Our school has been identified as being one of those at high bushfire risk and is listed on the BARR. Where possible, we will provide parents with up to four days notice of a potential Code Red day closure by letter and SMS message/phone tree. A Code Red day will be determined by the Emergency Management Commissioner no later than 1.00 pm the day before the potential closure. Once we are advised of the confirmation of the Code Red day we will provide you with advice before the end of the school day. • No staff will be on site on days where the school is closed due to a forecast Code Red day. • School camps will be cancelled if a Code Red fire danger rating day is determined for the Bureau of Meteorology district in which the camp is located. • As a bus co-ordinating school all bus routes will be cancelled. • Depending on which Bureau of Meteorology district is impacted bus route cancellations may affect our school. As part of preparing our school for potential hazards such as fire, we have updated and completed our Emergency Management Plan, reprioritised any maintenance works that may assist in preparing for the threat of fire and cleared our facility’s grounds and gutters. • Make sure your family’s bushfire survival plan is up-to-date and includes alternative care arrangements in the event that our school is closed. • Ensure we have your current contact details, including your mobile phone numbers. Keep in touch with us by reading our newsletters, by checking our website and by talking to your child’s teacher or any other member of the teaching staff about our emergency management plan. • Most importantly at this time of year, if you’re planning a holiday or short stay in the bush or in a coastal area, you should check warnings in advance of travel and remain vigilant during your stay. • If your child is old enough, talk to them about bushfires and your family’s bushfire survival plan. Our school has a current Emergency Management Plan in place to deal with any incident that may arise. This plan is lodged with the Department of Education & Training as well as local emergency services. We have the capability to shelter in place and to protect the assembly points at school. If you have any queries please contact Ken in the office. Please head to the Sunsmart website for information on how to be smart in the sun this summer. Parents of children with anaphylaxis and/or asthma are required to provide a current Action Plan, signed by a Medical Practitioner. Plans for children with allergies are able to be completed by parents. Blank Action Plan forms are available at the office. Bus & Car Conveyance Allowances have been extended until Friday 26th February. Please ensure these forms are returned to the office by this date. We also require the Local Excursion & Photo Permission from some parents. Please return these to the office ASAP. The school will be closed Friday 25th March (Good Friday) to Monday 4th April, inclusive. The office will reopen on Tuesday 5th April. Invoices were sent out on 27th January. Due to the new Australia Post Timetable, many parents have reported that they have received their statements late, or not at all. Due to this we have extended the due date by one week. The new due date is Friday 26th February. If you have not received one, please let the office know. If for any reason you are not able to pay in full by the due date, please contact our Business Manager Assistant; Tanya Blake via email: tanyab@cssk.vic.edu.au, mobile: 0419 428 328 or drop a note into the office. Need to place an advertisement in our school ‘Community Classifieds’? Please drop by the office, call us on 5479 2000 or send an email to enquiries@cssk.vic.edu.au with your information or enquiry. For classifieds advertising local businesses, we ask for a donation of $5 to the school each time the classified is placed in the Penny. This is a fabulous small wagon or larger hatch. You can fit the kids, your dog and camping gear for a weekend. Or equally feel safe and zippy in the city. Add a ‘pod’ to the available roof racks and go anywhere. home studio in Sailors Falls. Classes held every Monday, 7-8pm in the CSS&K Eurythmy room, from 8th February to 7th March, 2016. Suggested donation is $10 per class. We are delighted to be able to offer up to 17 young people (6-12 year olds) and their parent/guardian the opportunity to participate in the Inside the Circus Program being offered by Flying Fruit Fly Circus in the lead up to and on the night of their performance at Ulumbarra Theatre on Saturday, April 2 at 6pm. As numbers are limited to 17, we will have to work on a first in basis. Expressions of interest must be received by Thursday 25 February. Circus is great for confidence, fitness and fun! Fantastic new locally made film about an incredible new way of farming and thinking about food. Theatre Royal, Saturday 27th February, 3pm & 8pm. Now that the holidays are over and families are settling back into school, perhaps you are thinking about how you might develop yourself over the coming year. With this in mind, we invite you to join any of our inspiring evening courses for adults commencing Wednesday 10th February from 7.00 p.m. at the Melbourne Rudolf Steiner Seminar. These courses are for everyone seeking to develop their understanding of Rudolf Steiner Education. Each evening we have a movement or artistic activity, supper and then a lecture/discussion. The evening also offers an enjoyable social experience. Have a look at our website for a full overview of these programs, or to enrol on-line. • Understanding Child Development and Rudolf Steiner Education, which considers the child during the Primary years.